NEW YORK–(BUSINESS WIRE)–The economic promise of digital technologies is being put at risk by inadequate education and corporate training systems, according to Accenture (NYSE: ACN). 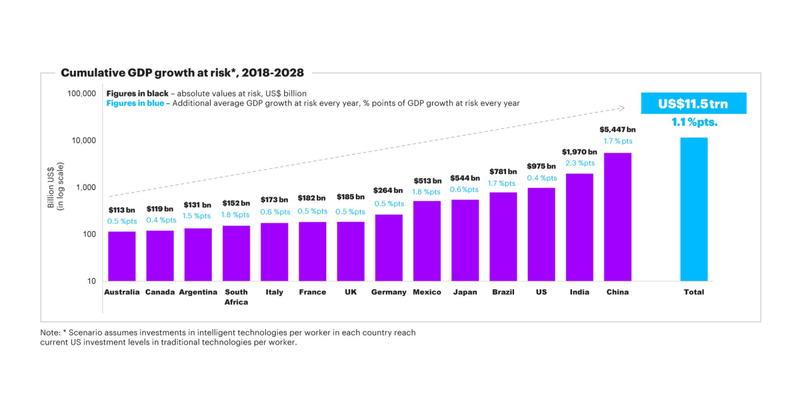 Unless radically new learning approaches are adopted, the failure to close the skills gap could result in 14 of the G20 economies forgoing as much as US$11.5 trillion in GDP growth promised by investment in intelligent technologies over the next ten years. The report, It’s Learning. Just Not As We Know It, published in collaboration with the G20 Young Entrepreneurs’ Alliance (G20 YEA), includes ground-breaking analysis that helps organizations assess their future workforce to prepare skilling strategies. It reveals how intelligent technologies will change the tasks that make up work and identifies the new skills that will be required to perform them. It calls for education and corporate training systems to commit to three areas of action in order to develop these new skills more effectively. According to the report, on average across the 14 economies covered, 51 percent of worker time is subject to potential augmentation as intelligent technologies enhance people’s capabilities. Thirty-eight percent could potentially be automated, but the impact varies between job roles and geographic markets, pointing to the need for targeted interventions to accelerate opportunities and manage risk. In the U.S., for example, workers in Empathy and Support-related roles, such as nurses, represent the largest single share of employment and have the greatest opportunities to boost productivity through augmentation. Sixty-four percent of their work time could be augmented, and Accenture research finds that 14 percent of augmentation could take place in the next ten years. Appropriate investments in skill building could fulfil demand for as much as 1.4 million additional workers in these roles over the coming decade. Complex reasoning, creativity, socio-emotional intelligence and sensory perception are the skills that are rising in importance across almost every single work role, according to the report. The importance is set to increase further with the adoption of intelligent technologies. Speed up Experiential Learning: Deploy a range of techniques, from design thinking in the board room to simulation training tools for more technical roles; from on-the-job training initiatives to apprenticeship schemes. In schools, provide active project-based learning and team-based learning activities. Apply new technologies like virtual reality and Artificial Intelligence (AI) to make learning more immersive, engaging and personalized. Shift focus from Institutions to Individuals: Education and training targets should incentivize each individual to develop a broader blend of skills, rather than only producing certain numbers of graduates from specific courses. This blend must include a focus on complex reasoning, creativity and socio-emotional intelligence. Empower Vulnerable Learners: Older workers, the less educated, those in physical manual labor roles, and in smaller businesses are more vulnerable to work dislocation and have less access to training. Targeted intervention is required to guide these learners to appropriate training and career pathways. Courses must be more modular and flexible to adapt around their life commitments. New funding models must encourage lifelong learning, such as grants to support personal training plans. For more information on this analysis, please visit https://www.accenture.com/us-en/insights/future-workforce/transforming-learning. Or join the conversation: #FutureWorkforce #G20YEA. Accenture used statistical clustering to analyze skills, abilities and work activities. These were used to develop 10 empirically-derived groupings of roles and occupations that utilize similar skills, perform similar tasks and that can be expected to be affected in similar ways by intelligent technologies. The 10 role clusters were used to categorize the workforce composition of 14 G20 countries. To calculate forgone growth premium, Accenture analyzed how intelligent technologies will impact specific work tasks and skills needs. Using Data from the Occupational Information Network (O*NET) of the U.S. Department of Labor and from the International Labour Organization (ILO), Accenture calculated total potential time susceptible to automation and augmentation for different occupations. GDP growth (2018-2028) was modelled under two supply assumptions in order to measure the GDP at stake if skilling needs are unmet. Forgone Growth Premium was presented under two different scenarios about investment in intelligent technologies. Accenture also conducted in-depth interviews with business leaders, experts and practitioners from multiple sectors, and drew on the expertise and experience of Accenture’s own professionals in learning, technology and talent development. Visit https://www.accenture.com/us-en/insights/future-workforce/transforming-learning for full methodology.